Hype, or is Bombardier taking a gamble? But, lets start at the beginning. 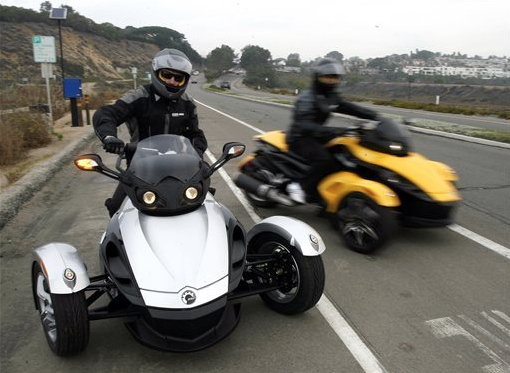 U.S. safety regulators are investigating two reports of fires in the Can-Am Spyder three-wheeled motorcycles. The motorcycles are made by Bombardier Recreational Products Inc. (BRP) of Canada and the probe covers about 52,000 motorcycles from the 2008 through 2014 model years and they are looking into what is causing the fires. Bombardier has had three recalls to date in 2012 and 2013, and all involved the risk of fires. Last year, the company recalled about 8,200 Spyders because brake fluid leaks could cause fires. In 2012 it recalled about 34,000 because fuel vapors could leak due to an ill-fitting gas cap. It also recalled 9,600 because fuel vapors could exit a vent hose in the engine compartment. I don’t want to draw any similarities because these are very different situations, but many of you might recall the Ford Pinto. It was one of the biggest continuing automotive news stories in the late 1970s with dramatic tales of exploding Fords on the highway and considerable awards from civil-court juries that were presented to victims of accidents involving the cars. At the time, experts calculated the value of a human life at around $200,000, while a serious burn injury was worth about $67,000. Using an estimate of 180 deaths and 180 serious burns, someone at Ford put on paper that the cost to redesign and rework the Pinto’s gas tank would cost close to $137 million, while possible liability costs worked out to around $49 million. Ford’s corporate legal machine went to work, however, when the memos regarding the liability assessments were leaked and entered into evidence, the cases were as good as over and Ford paid dearly in civil claims, public image and as a brand for product safety. BRP is a world leader in the design, manufacturing, distribution, and marketing of motorized recreational vehicles and powersports engines. The term “transparency” means much more than the standard business definition and its my hope that the company will be candid with the motorcycle riding public beyond the narrow interpretation of legal compliance on the risk of fires.